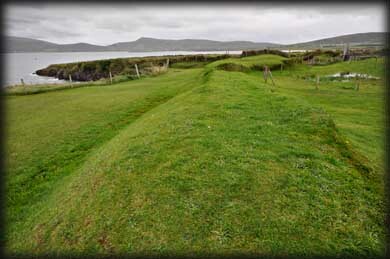 Pictured above is the small oval promontory upon which Dún an Óir was built. The fort was enclosed by a rampart and the approach was defended by a small causeway with a drawbridge for access. There were further defences on the land adjoining the promontory. 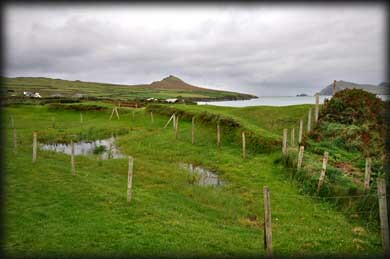 This small spit of land near the tip of Dingle Peninsula witnessed a horrific massacre of Italian and Spanish troops and Irish men at the hands of the English. The soldiers had been sent by Pope Gregory to assist the Irish in the second Desmond Rebellion in 1580. About 600-man strong, they were forced to garrison themselves within the promontory fort after their ships had been blockaded within the bay at Smerwick and the mountainous terrain and opposition forces blocked their escape. They were quickly surrounded by an English force of 4000, under the command of Lord Grey, and after a short siege including heavy artillery onto the fort by sea which ultimately destroyed the fort they surrendered. According to oral tradition, the English, over the course of two days, beheaded all but the commanders, and lined up the heads in a nearby field. Their bodies were thrown into the ocean. The field of the massacre is now known locally as Gort a Ghearradh (the Field of the Cutting) while the field where the heads were buried bears the name Gort na gCeann (the Field of the Heads). An odd monument with twelve heads has been erected to honor those unjustly slain. In spite of the monument, the small sadly-eroding peninsular point and the water-logged fields seem hushed into silence by what they had seen. The remains of the landward defences are pictured above. They consisted of the rampart with a shallow external fosse. At the north and south end of the rampart there were bastions (Gun-positions). Situated: From Ballyferriter head southwest on the R559. After 1.3 K turn right for Ferriters Cove. Then 1.4 K turn right. After 2.6 K turn right. (Signposted Fort Del Oro). Take the Next left go to Car Park at the end of road. Discovery Map 70: Q 3492 0708. Last visit Sept 2012.